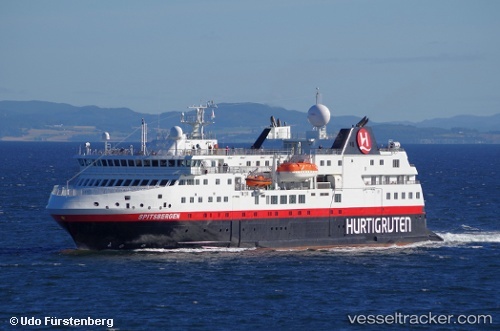 With Norway’s Hurtigruten having to share the coastal express route with compatriot operator Havila Kystruten from 1 January 2021 – Hurtigruten operating seven vessels and Havila four vessels – it comes as no surprise that Hurtigruten has announced that it will move four vessels from its existing coastal express fleet into its expedition fleet by 2021 – FINNMARKEN, MIDNATSOL, SPITSBERGEN and TROLLFJORD – taking the expedition cruise fleet to ten vessels. The four new vessels will be used for year-round expedition cruises. The "Spitsbergen" changed the route for the second time this year. The ship would actually call at Hornvika on June 6, 2018,, but sailed on to Kai west of Honningsvåg due to the strong wind. Hurtigruten’s latest ship was christened on July 6 in a special ceremony at Svolvaer, Norway. Hurtigruten welcomed its 14th ship, the MS SPITSBERGEN in Svolvaer, Norway with a gala christening ceremony. On July 6, at 8:00 PM, Godmother Cecilie Skog, a renowned explorer who has taken part in expeditions to both poles and Mt. Everest, sent a bottle of champagne into the ship’s bow. Two other Hurtigruten vessels, the RICHARD WITH and MIDNATSOL joined the SPITSBERGEN in Svolvaer harbor. After the ceremony, which was witnessed by thousands of spectators, there was a concert by the band Violet Road. The 243-berth, 7,344-gt SPITSBERGEN will serve a dual role as a coastal express liner on the Hurtigruten run and polar cruising expeditions.